Patrick believes that a well-organized financial strategy can help you be a better healthcare professional and allows you the freedom to pursue your personal passions without distraction or stress. Beginning with the end in mind, Patrick offers a client centric focus that is designed to meet the needs of the physicians, pharmacists, dentists, nurses, administrators, educators, healthcare executives and business owners that he serves. 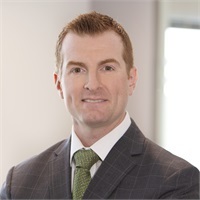 As an advisor with an extensive back-ground and connections to the healthcare industry, Patrick understands the nuances of life as a medical professional. His priority is to help address his client’s financial burdens so they can focus on what is truly important to them. Outside of the office, Patrick is passionate about charitable endeavors and serves on the board of Crossing4Mercy, providing surgical care in Africa. As a former college athlete, he loves all things fitness and sports. Born and raised in Boston, Patrick’s favorite sports teams are the New England Patriots and the Boston Bruins. Patrick lives in Kirkwood with is wife, Rachel and his son, Chase.